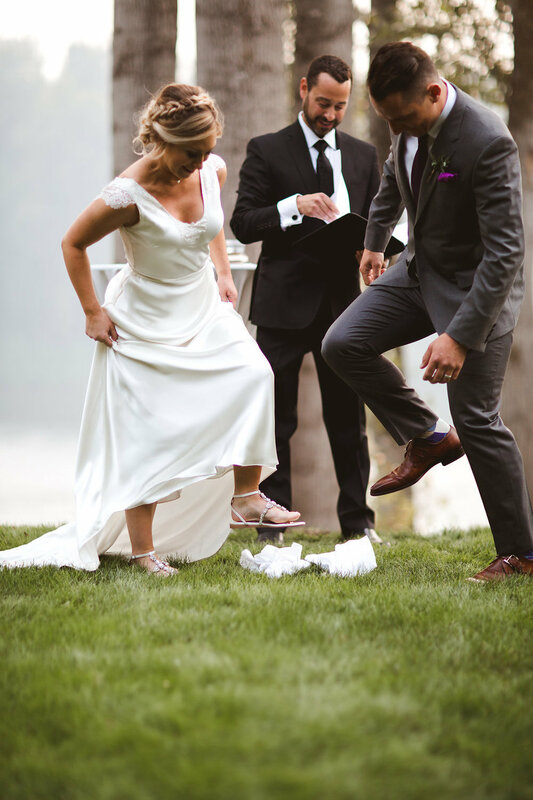 Alice + Nathan were so fun to work with! 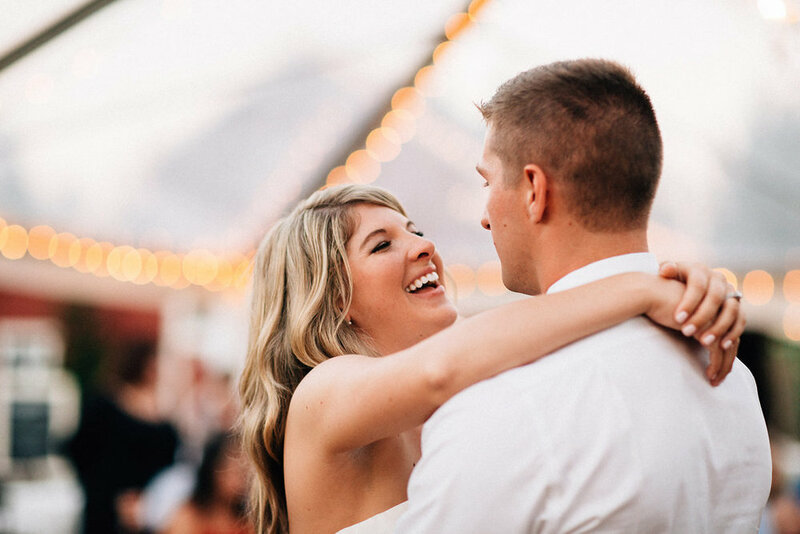 Not only did Alice know what she wanted but she made decisions quickly and we had a great time planning their wedding. 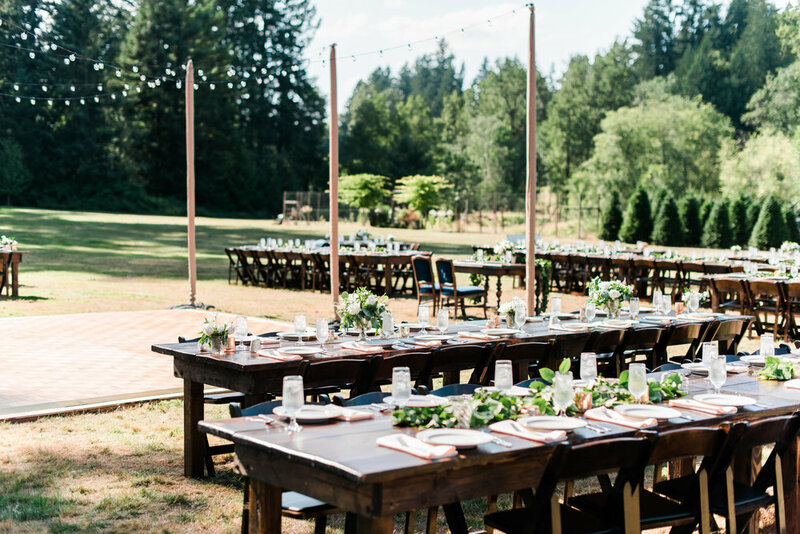 For the venue, they wanted something outdoors, but close in to town. 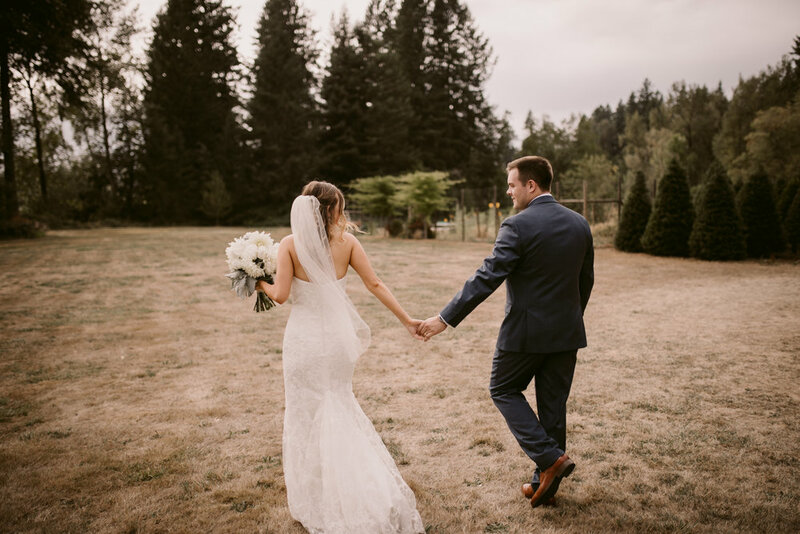 They chose Riverhaven in Wilsonville, which is nestled amongst Christmas trees and the Willamette River. The perfect location, close enough proximity to town, but it also was its own private haven in the middle of nowhere. The decor was simple yet elegant. 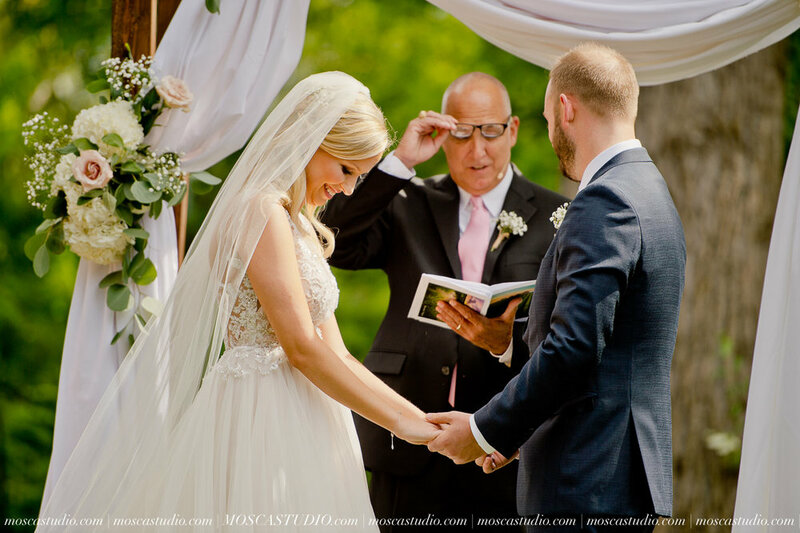 A sweet ceremony and a tearful groom, there is nothing better! We opted for a clear tent dripping with fairy lights which made for an intimate setting for dinner. 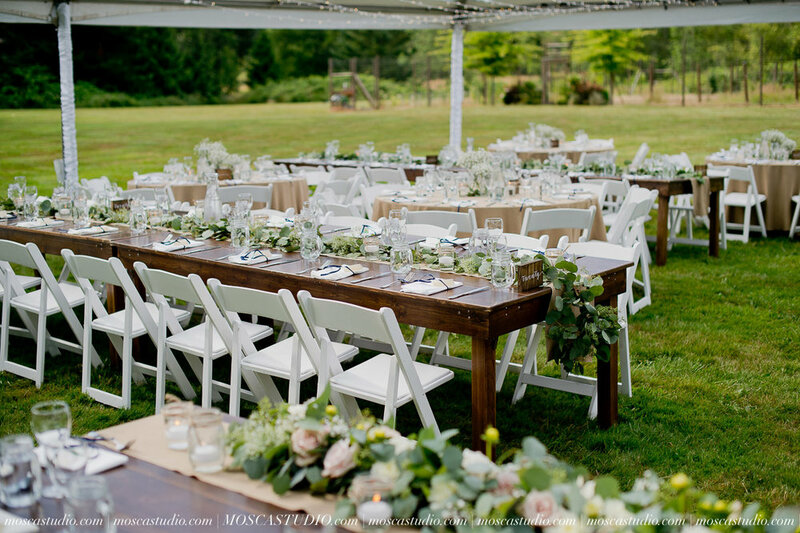 Guests sat at wooden farm tables with blush, ivory florals with touches of gold accents. A delish dinner provided by Devil's Food Catering had everyone grinning from ear to ear with their insanely good fried chicken and Event Team Entertainment had the dance floor packed all night. Such a magical evening! 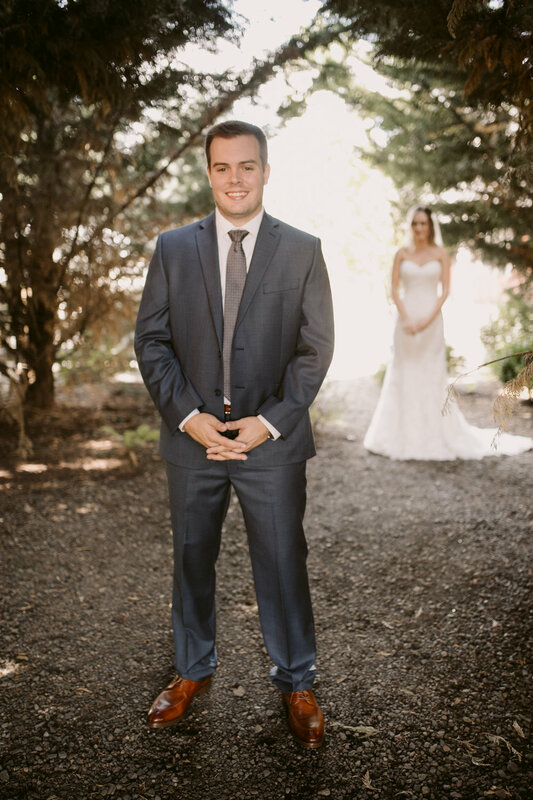 Alice + Nathan, thank you for letting me be a part of your special day! 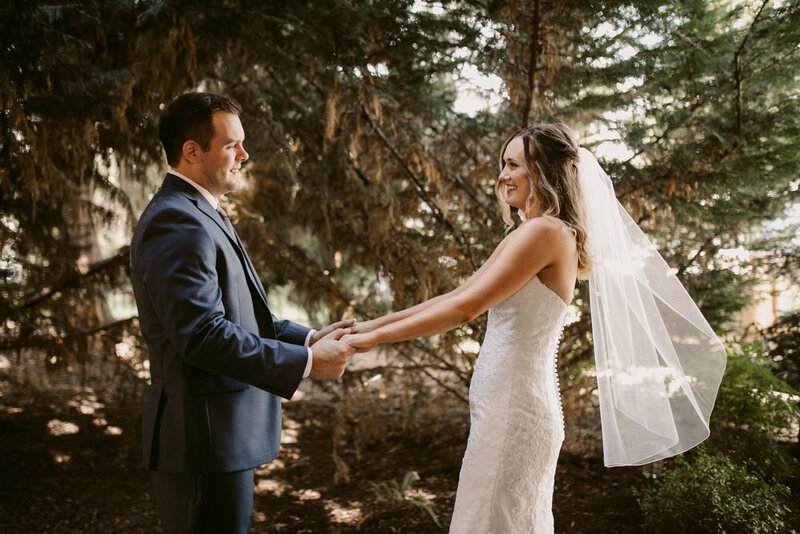 From day one of meeting and working with Courtney and Matt, I knew their wedding day would be wonderful. 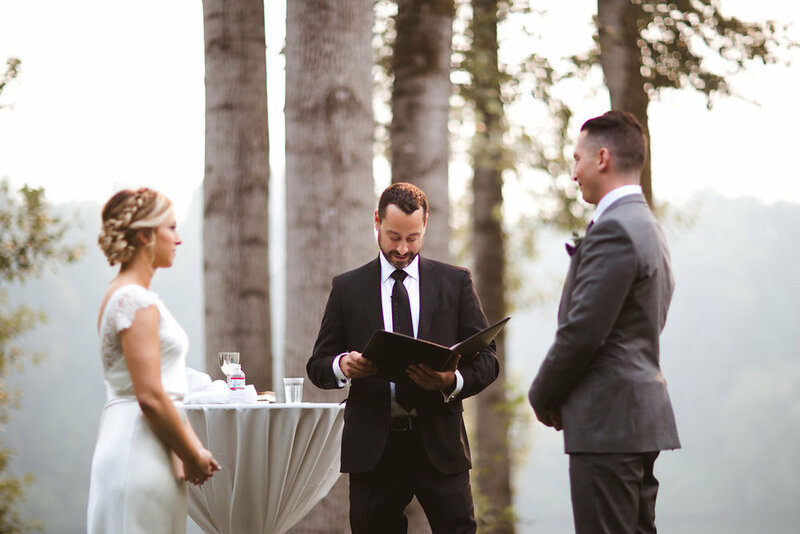 Not only does the couple adore each other, but they were surrounded with supportive family members who were eager to help. 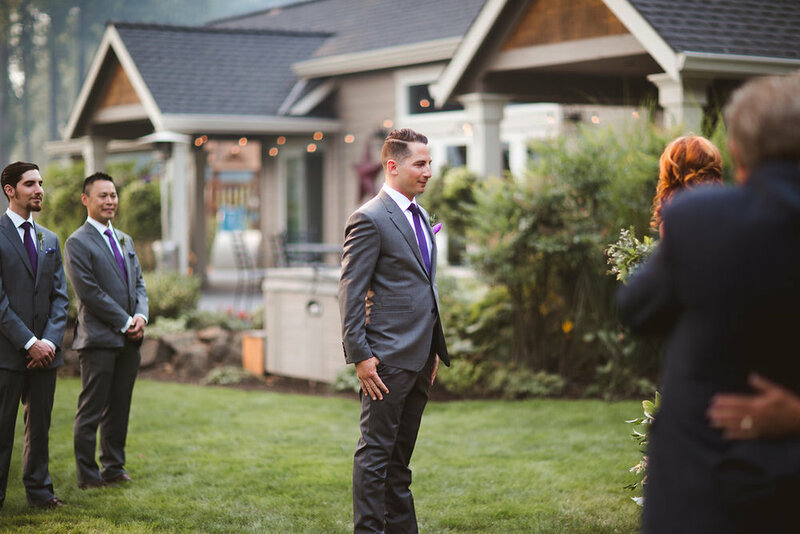 We all worked together to plan the classic, Portland summer, outdoor wedding experience for both the bride and groom as well as the guests. Typically, we don’t have to worry about rain in September, but the morning of the wedding River Haven Farms was shadowed by rain clouds. Luckily the weather turned just in time for photos and stayed clear until the end of the evening – a wedding day miracle! 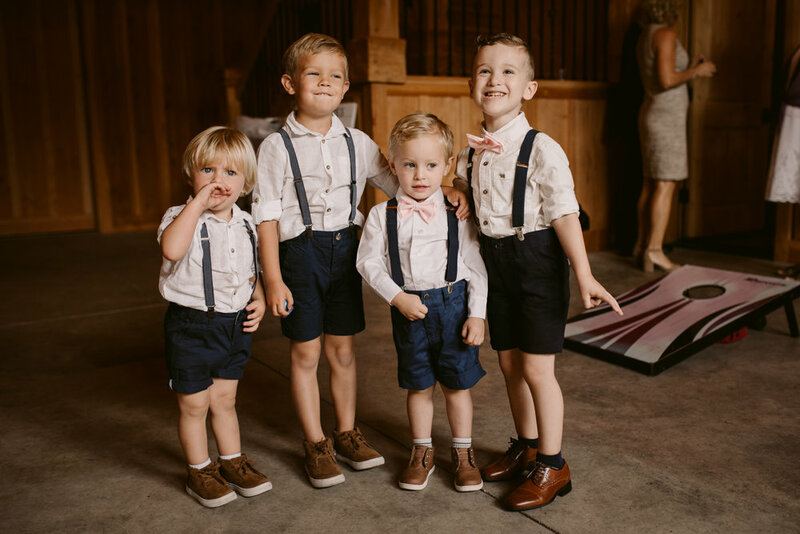 Guests parked in what looked like a quaint family Christmas tree farm and walked over to the outdoor ceremony where they set gifts on a vintage truck and were greeted with fresh lemonade. 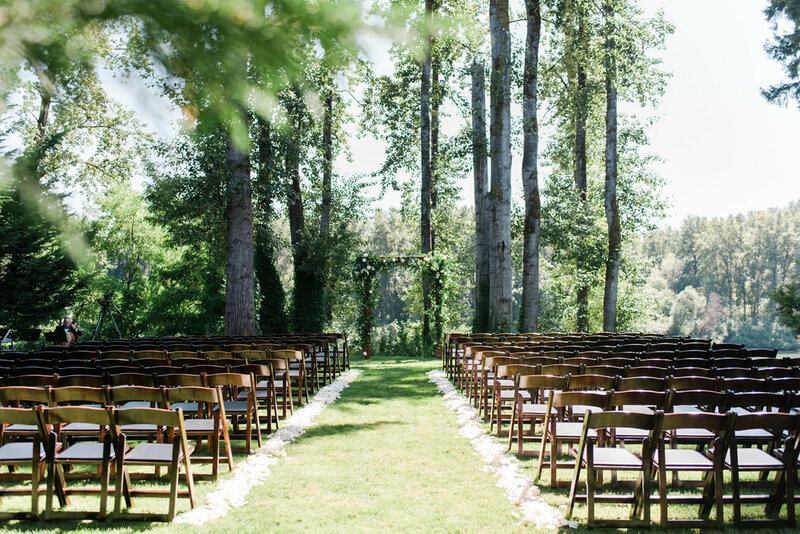 The aisle was lined with rose pedals and a string duo played while bridesmaids and groomsmen recessed in. 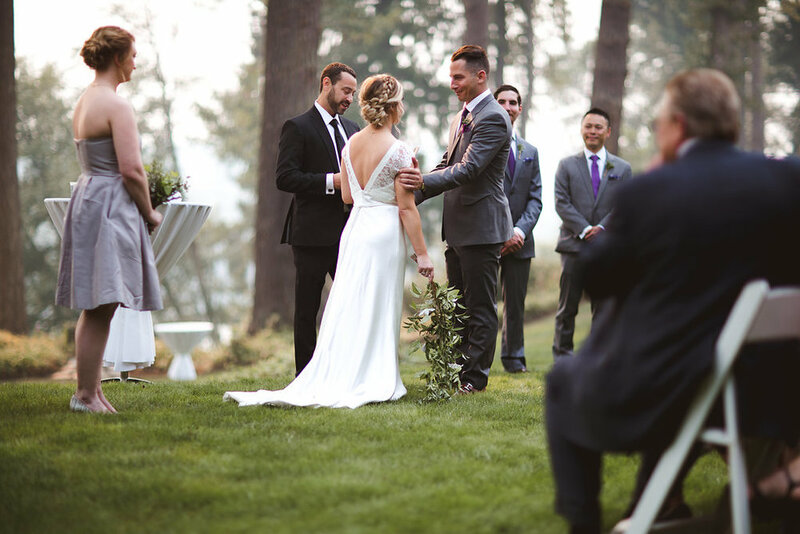 The bride and her father walked down the aisle to the tune of her brother playing guitar and everyone enjoyed the view of the Willamette River. Both the ceremony and cocktail reception area overlooked the river just before sunset then guests were guided to the River Haven’s front lawn where dinner was held under a large white tent. Dalton’s Northwest Catering served a delicious dinner buffet under the River Haven barn awning and displayed a cupcake bar on couple of wine barrels. Guests sat at round tables with beautiful floral centerpieces and the bridal party sat at a long head table with a stunning floral garland. 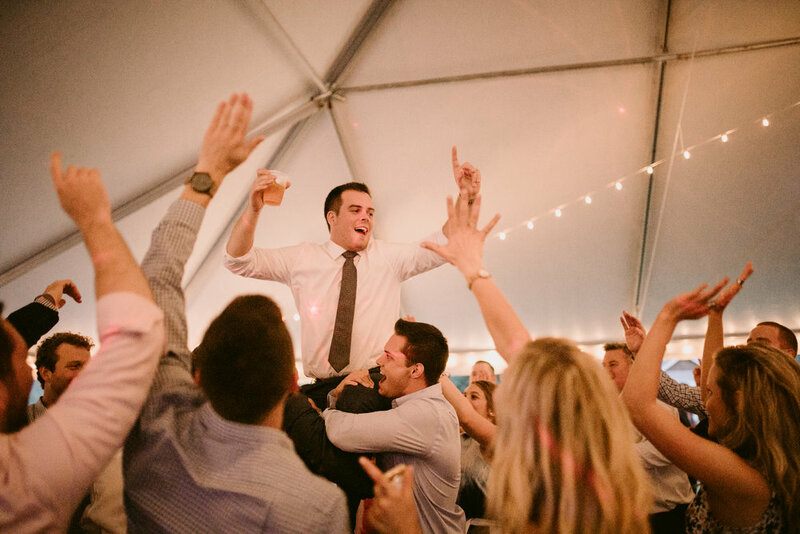 My favorite part of the day was listening to the heart-felt toasts from family and friends – specifically the childhood memories shared by the bride’s father. 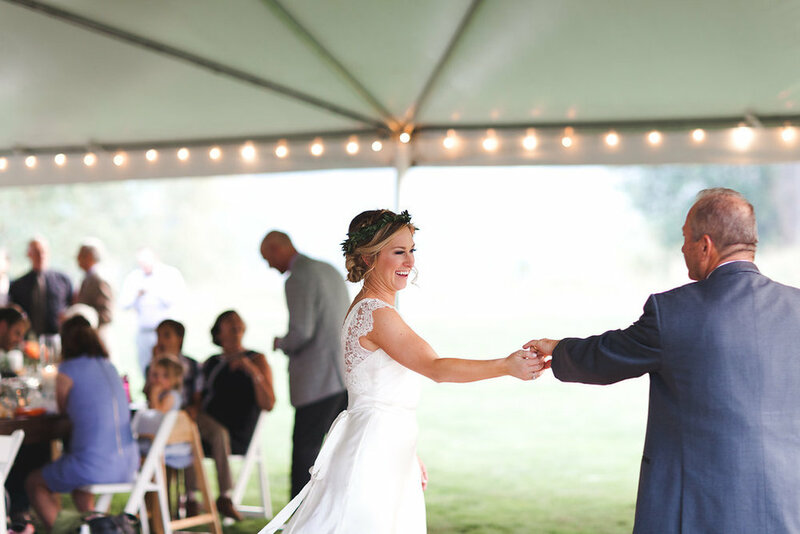 The sky was clear until the dance floor opened then it began to rain but the dance floor was protected by the tent so guests danced the night away. 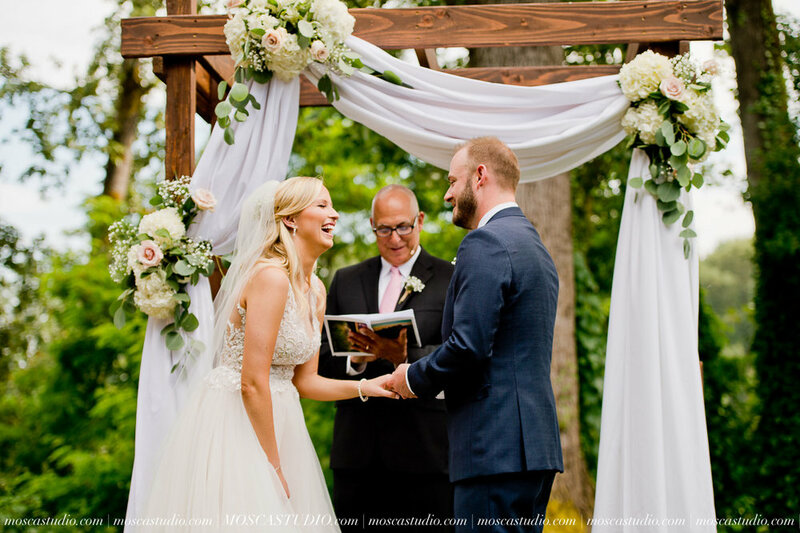 Congratulations again, Courtney & Matt! I wish you a lifetime of love! There is something so fun and secretive about a tucked away venue, when you get to wind up and around the backroads until you come to a dead end and find a beautiful place you might not otherwise had known of. 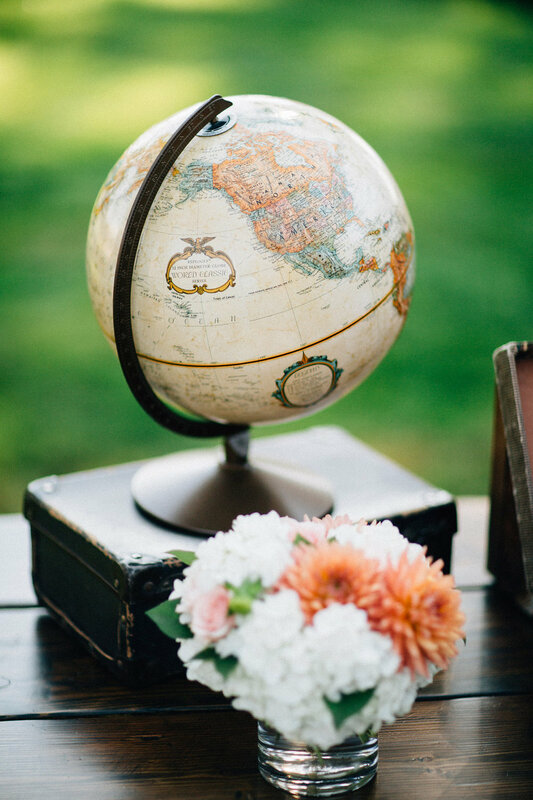 In this case I am talking about Riverhaven Farm, the location that Amy and Adrian chose to celebrate their marriage last July. This is a beautiful piece of land set along the Willamette River in Wilsonville Oregon. 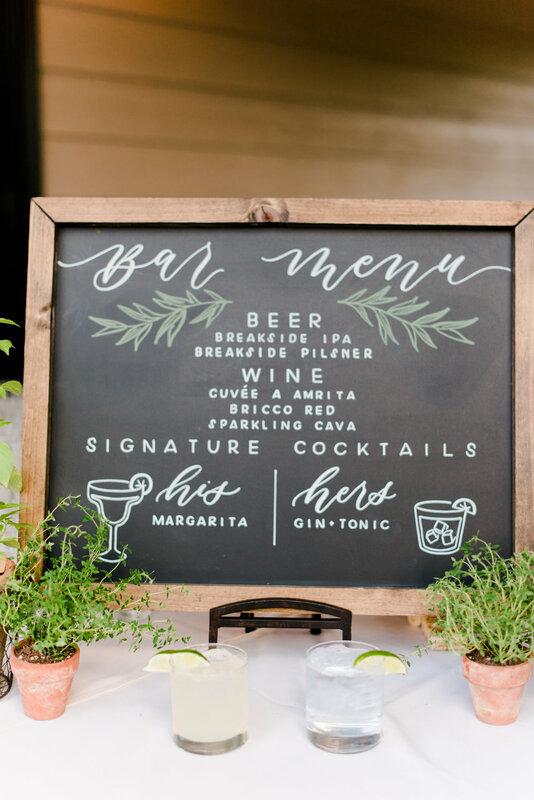 There was an amazing team of vendors who worked to transform the space for the couple. 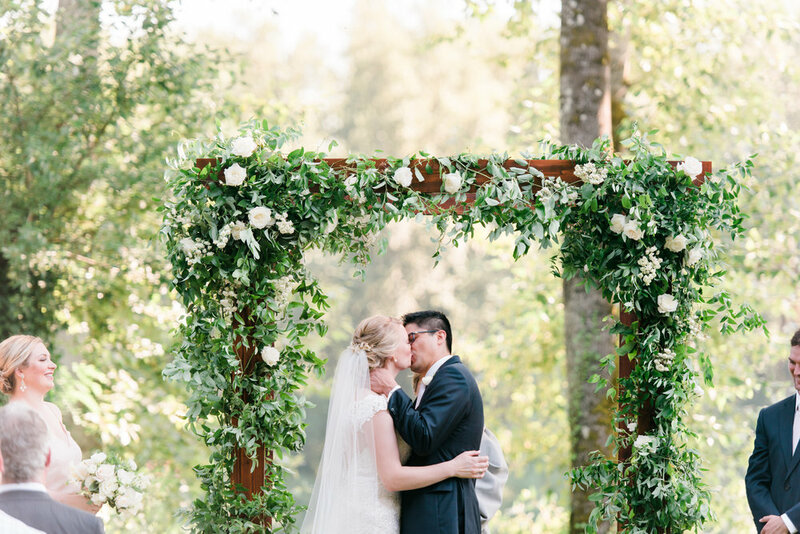 It all started with Blum, who spent the morning decorating the beautiful wooden arch, built by the Bride's father, before finishing the rest of the gorgeous floral arrangements that accented the entire property. 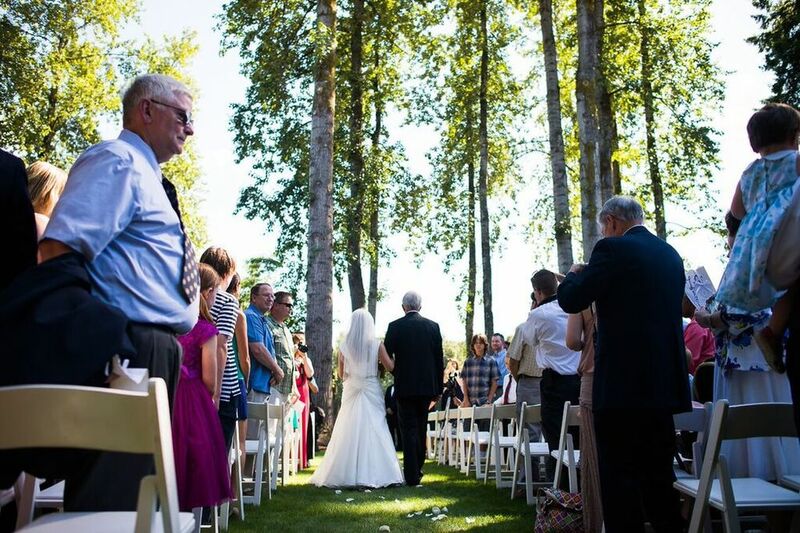 The ceremony took place on the side of the home that sits on the property, and is neatly tucked up against the river. 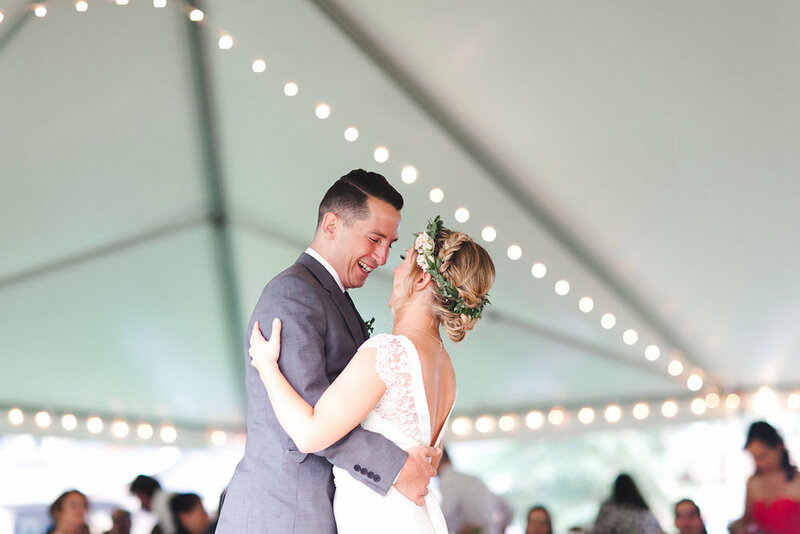 Duo Con Brio played as the couple exchanged their vows. 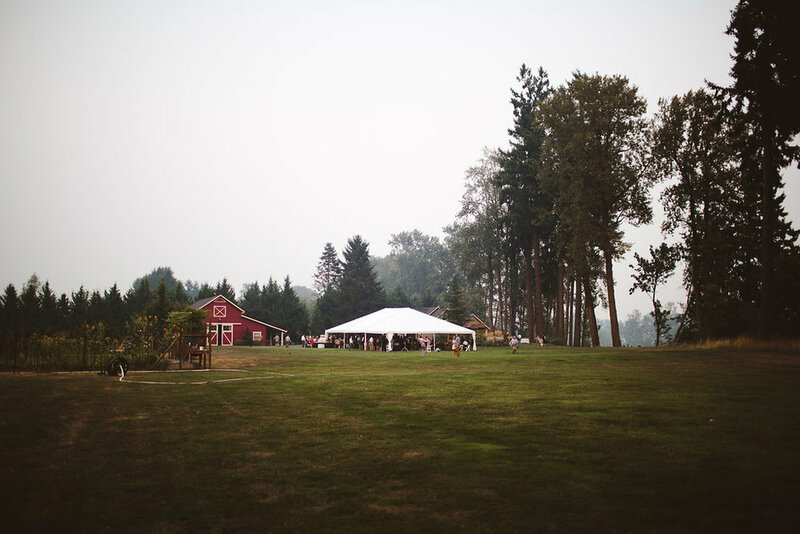 Once they said their “I Do’s”, everyone joined the couple on the lawn for cocktails and appetizers passed by Dalton’s Northwest Catering. 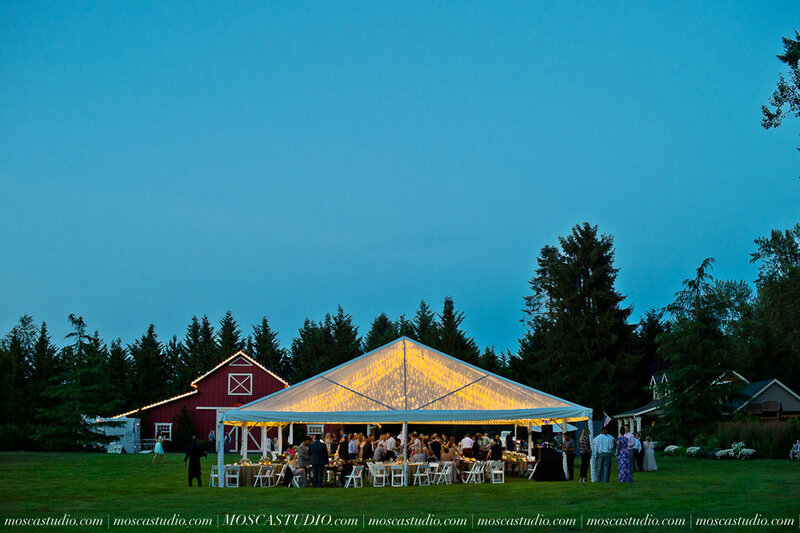 Guests were seated family style at farm tables that overlooked the landscape. Deyla Huss was able to sneak the couple away for some pretty epic sunset shots, which would also make the cut for the couples wedding video, shot by Moving Pictures. 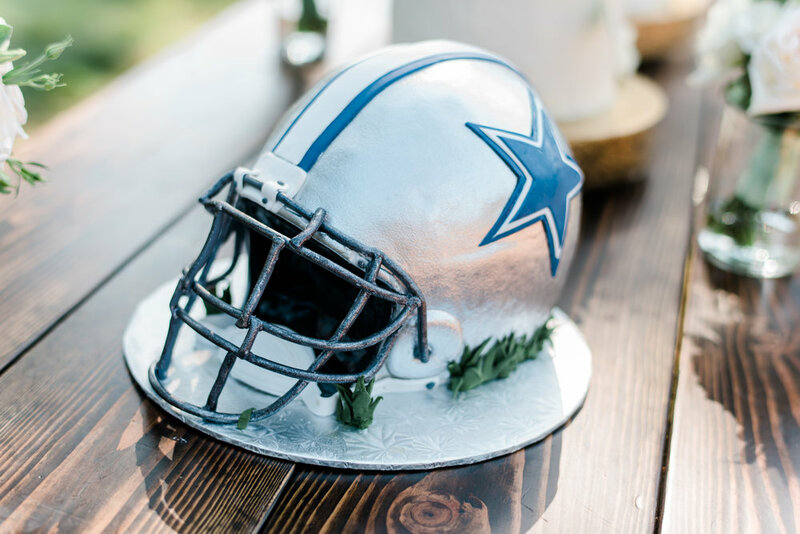 Right before they cut the cake which was provided by Papa Haydn, the groom was surprised with a Dallas Cowboys themed grooms cake from Laurie Clark. 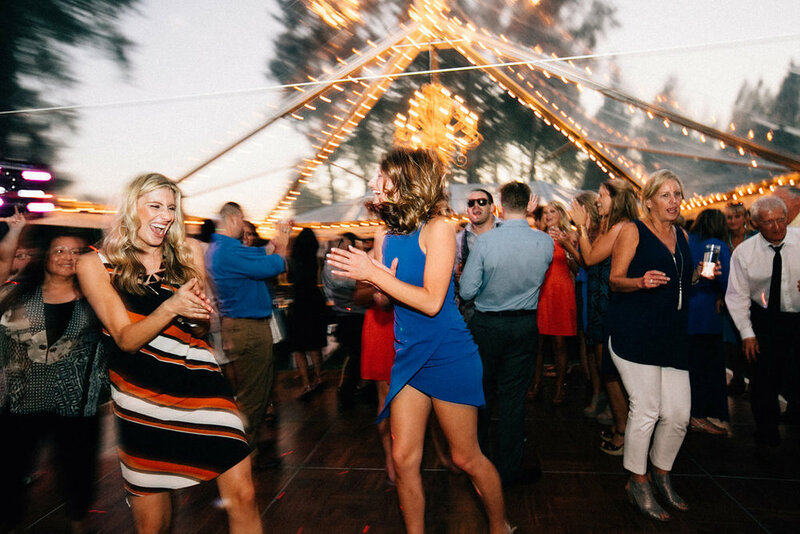 The guests were eager to dance as DJ Mighty Moves kept the party going on an outdoor dance floor with lighting from BowerBird Events. This was certainly a night to remember!! Congratulations Amy and Adrian, I’m so thankful I was able to be a part of your special day! 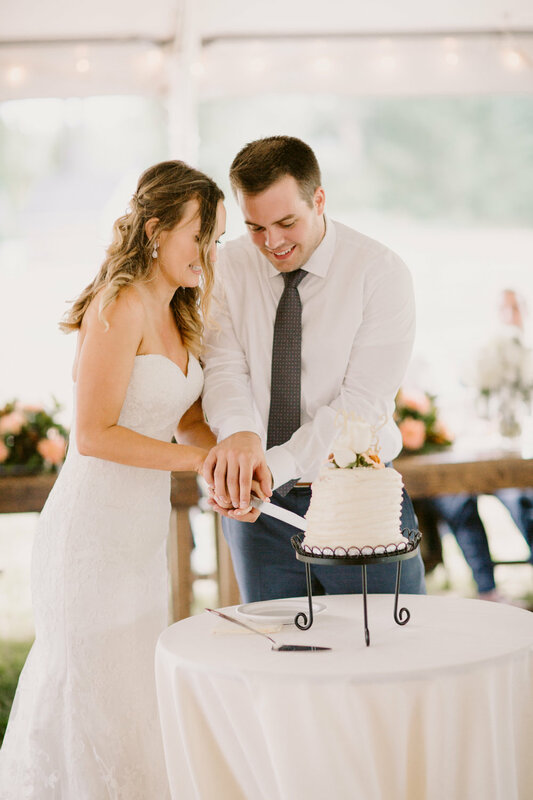 A romantic, elegant, sweet summer garden party, Brenna and Ryan’s wedding was the most natural extension of their families’ warm hospitality as they celebrated these high school sweethearts tying the knot. 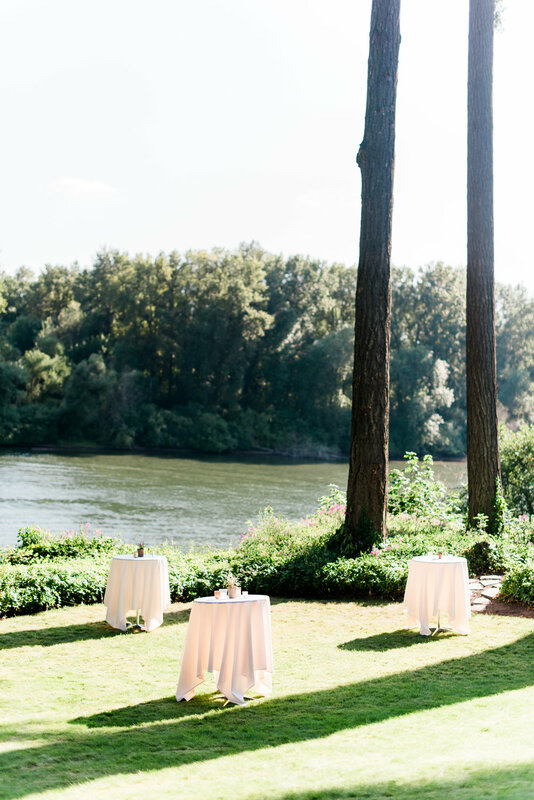 Hosted at a private residence on expansive lawns by the Willamette River, the late summer sunshine and cool breezes set the tone for a relaxed evening of cocktails, conversation and a casual dinner. 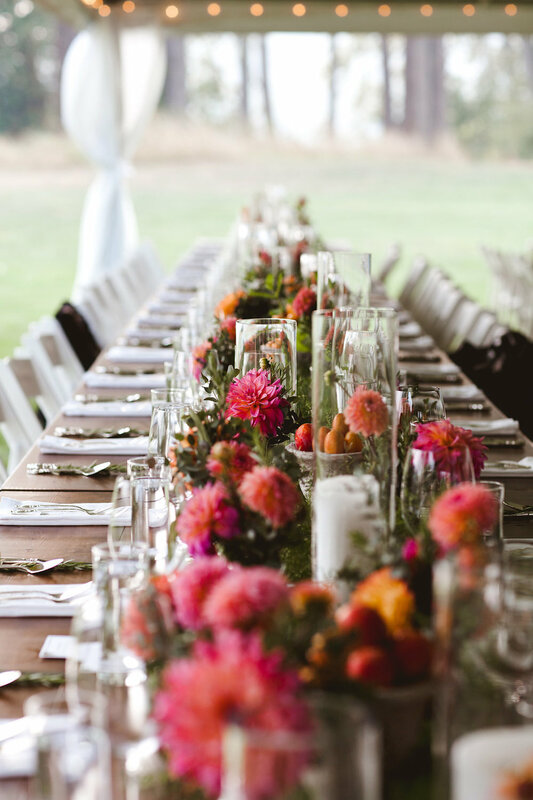 Brenna and Ryan did not want to have a typical formal seated reception dinner, but rather encourage their guests to mix and mingle. So we planned a culinary adventure, featuring small bites at three different stations each showcasing a place where Brenna and Ryan had spent time together. The “Take Me Out To The Ballgame” station was a nod to Ryan’s college baseball years, while the Spanish Tapas and Mexican Tacos recalled past trips. Of course cake, ice-cream and sweet treats were also a necessary feature! 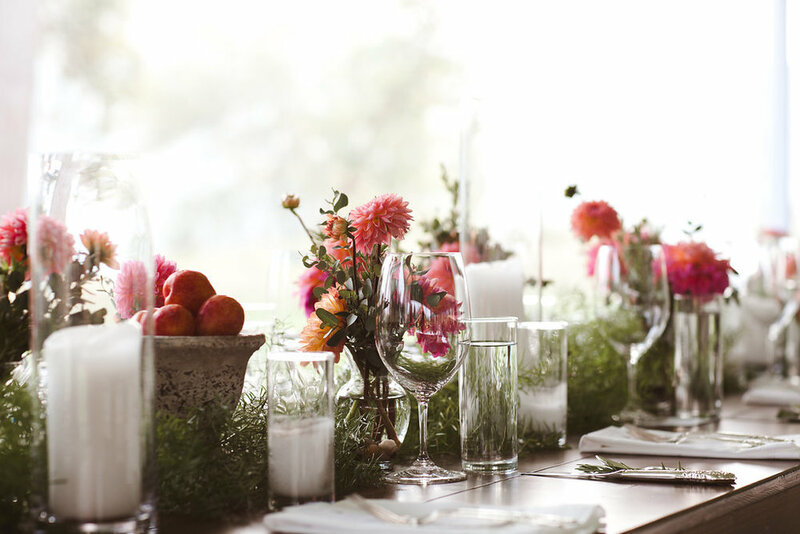 We had great fun with the décor, playing watercolor linens off with rich turquoise napkins, and lush floral centerpieces with tones of ivory, blush and pops of coral with rich greenery. 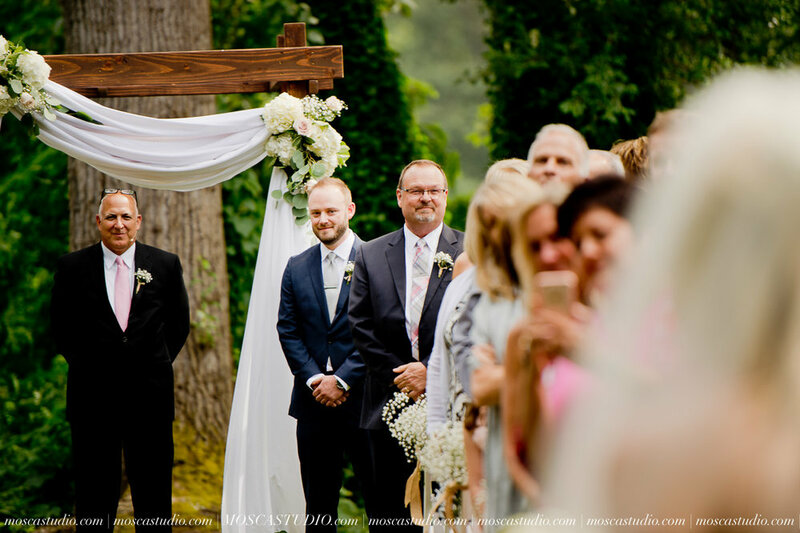 Ryan’s father constructed the dramatic arbor for the ceremony backdrop, reflecting the grand height of the trees lining the river bank. Cozy lounge seating formed intimate conversation clusters near the double-sided bar, and the old-fashioned style photo booth and lawn games were a source of great entertainment for all the guests. Lanterns and candles added sparkle as dusk arrived, and the spectacular clear tent shimmered with the reflection of the chandeliers and lights strung from the canopy ceiling. The complete effect was breathtaking. Congratulations again, Brenna and Ryan! It was a delight planning with you and your families, and a joy to witness your wedding. 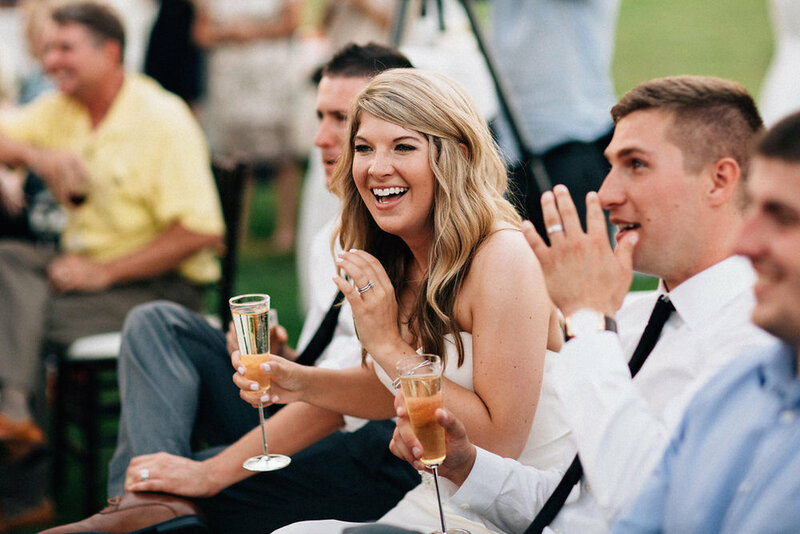 I can’t imagine a more perfect way to have celebrated the start of your married life! 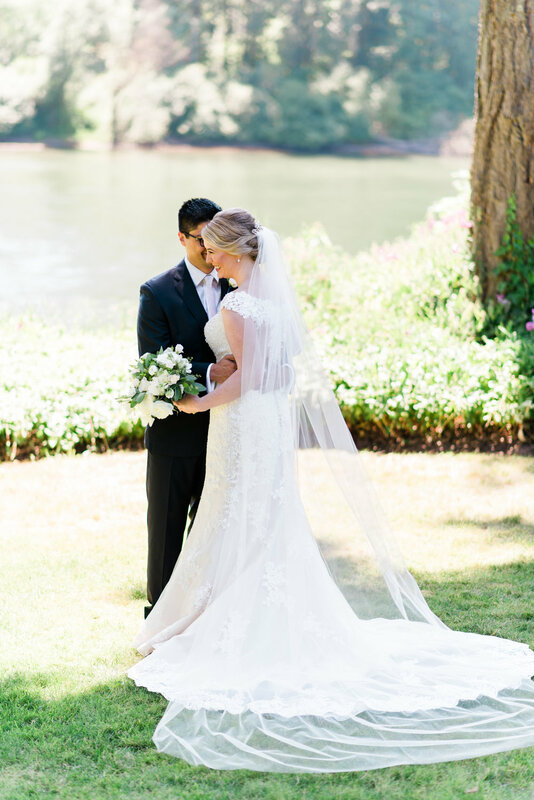 Also--big thanks to Portland Bride + Groom Magazine for featuring this fab couple. 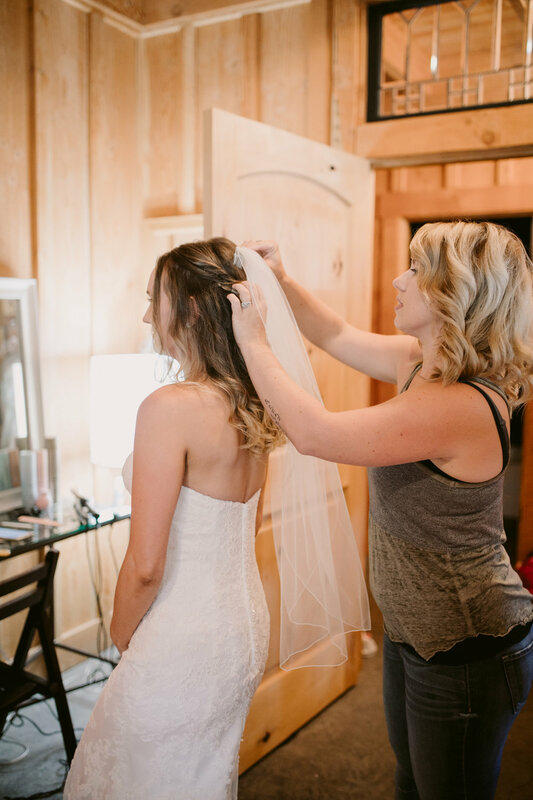 Ashley and John worked with Elizabeth to plan their summer wedding at Riverhaven Farms. 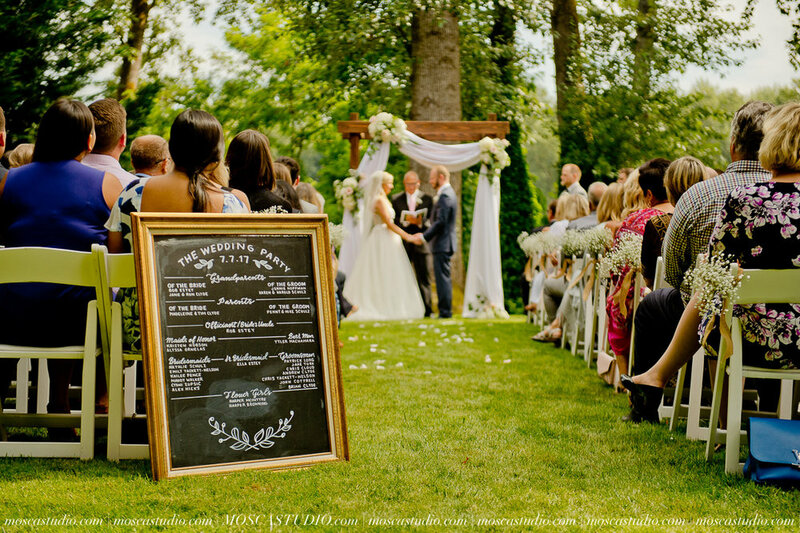 From the beginning Ashley and John had a vision for their wedding, which was to share what they loved so much about the Northwest with all their family & friends. 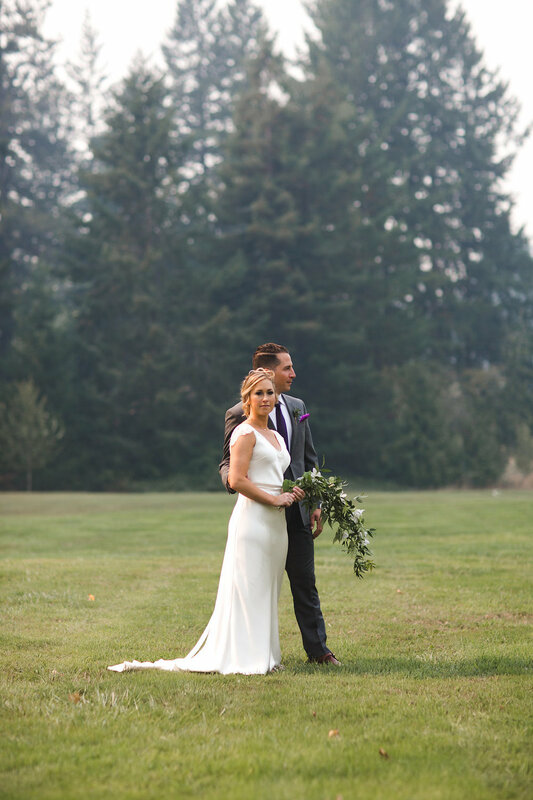 The day of their wedding was a smoky day with summer wildfires taking place in Oregon. While they were hoping for sunshine, the haze created an incredibly beautiful setting. As if a romance filter was put on the entire day and on every picture. 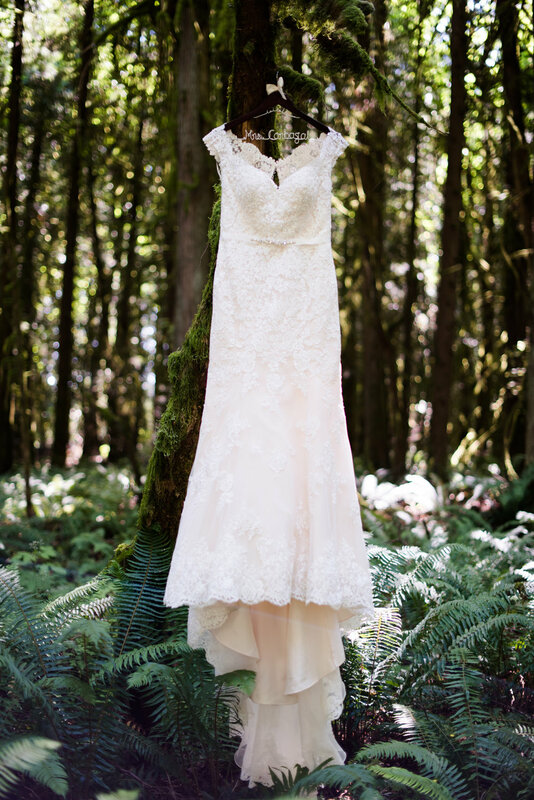 Ashley + John's ceremony took place in a small patch of grass surrounded by old growth trees, looking over a river. One of Elizabeth's favorite details of the wedding was the flowers Ashley carried down the aisle. Zest Floral created a stunning trailing bouquet with jasmine vine and white blooming clematis vine. 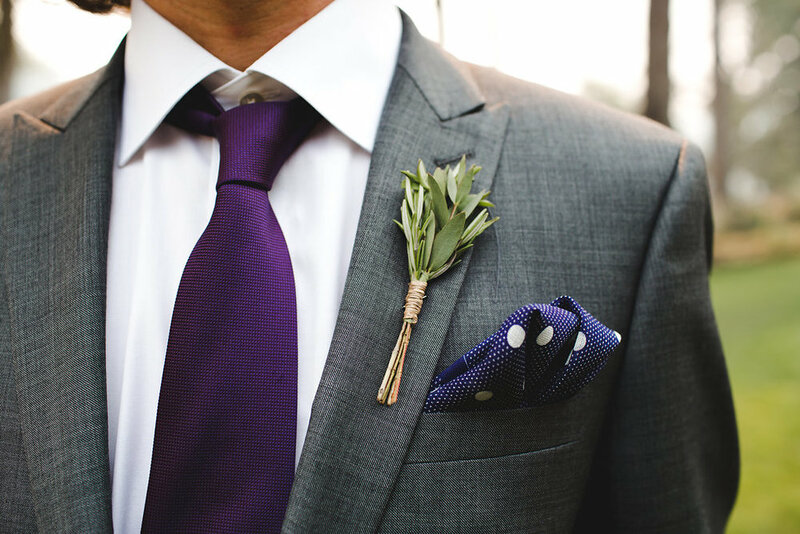 It was so unique yet the perfect touch for Ashley. The reception was beautiful. 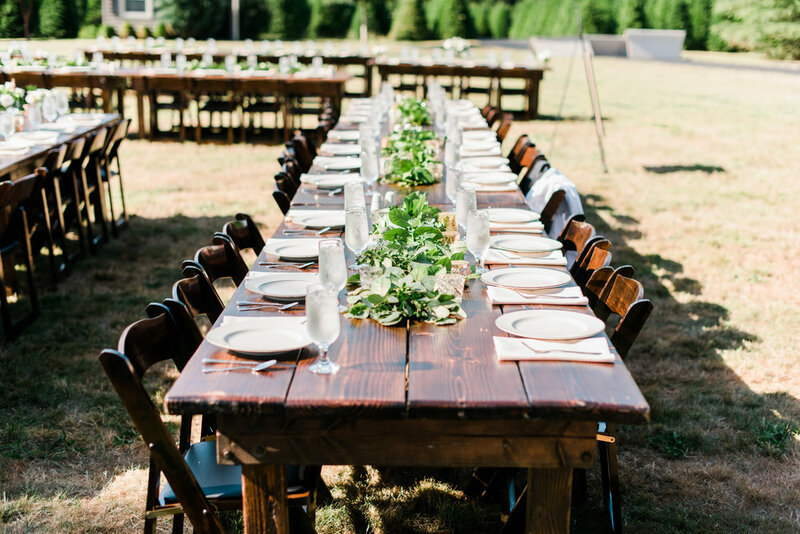 Guests dined on farm wood tables with greenery running down the center. 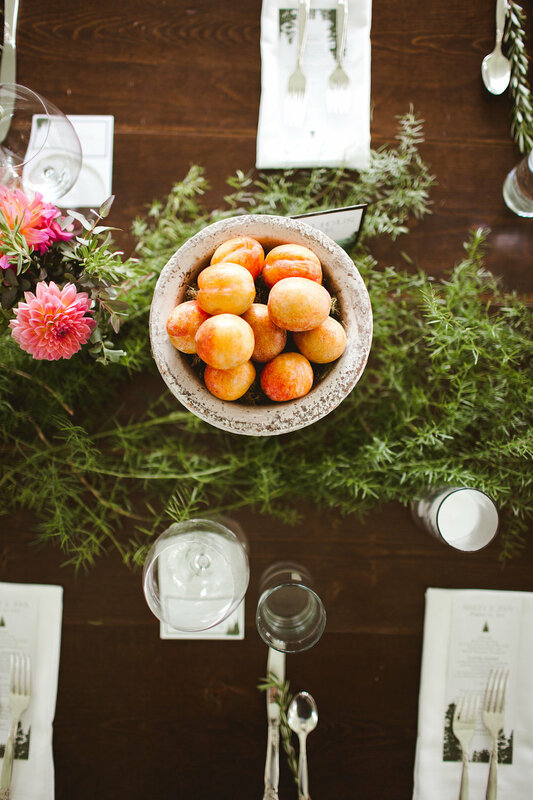 Each table had fun accents throughout the flowers including small bowls filled with colorful plums. After dinner guests enjoyed a Whiskey tasting hosted by Devils Food, showing off some of John's favorite spirits. 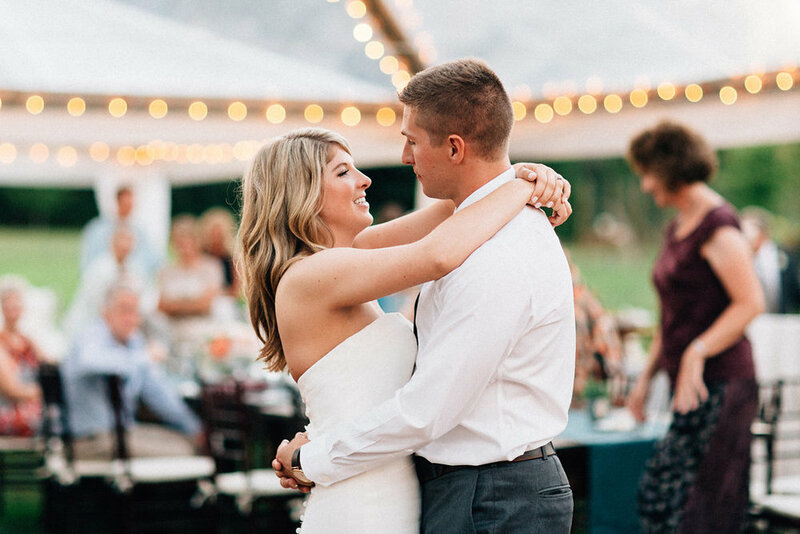 Heather and Kirk hosted a beautiful summer wedding at RIVER HAVEN FARM, filled with personal touches from friends and family. 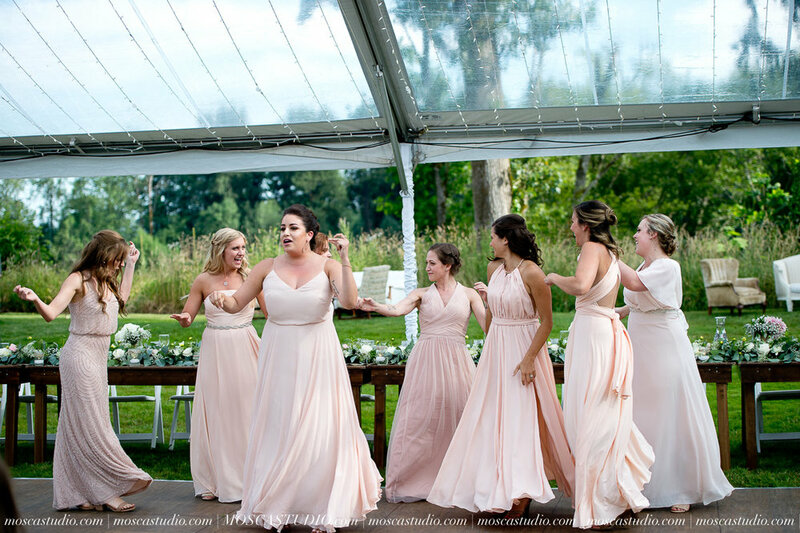 Several of Heather’s friends came together to form a wonderful chamber music ensemble for their ceremony, crafting a special Ave Maria arrangement for the bridal party processional and generally delighting the guests with their virtuosity. Kirk and Heather’s friend and pastor, officiated the ceremony with grace and humor and touching anecdotes of Heather and Kirk’s early relationship. The joyful atmosphere continued through the social hour with fun lawn games and an old-fashioned soda bar, while another group of friends set up a Jazz Band and played great toe-tapping rhythms. DALTON’S NORTHWEST CATERING provided a sumptuous buffet for dinner, while the best man and maid of honor roasted and toasted the bride and groom with great good humor. Dessert was a treat with a variety of delicious cakes from LAURIE CLAKE CAKES and a colorful candy display arranged by Heather’s sister and cousin. 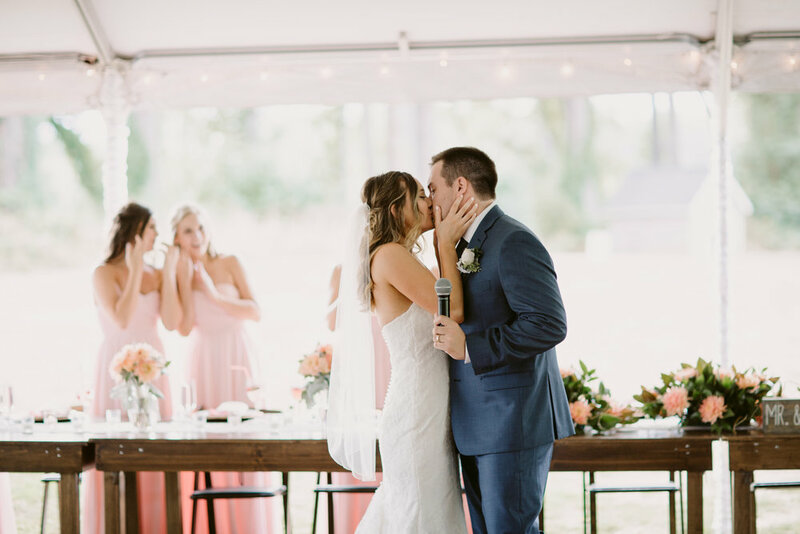 A custom kissing booth crafted by a friend and a few fun props became the focus of a photo booth, with Susannah from PETER MAHAR PHOTOGRAPHY snapping the photos. Once the dancing began in earnest, another friend stepped in to DJ, playing crowd favorites bringing everyone onto the dance floor! What a great party coordinated by KIRSTEN! Congratulations again to Kirk and Heather!